Teppanyaki Grill Reviews – these grills will be the center of any party! Today, we have seen most of the trading cooking methods being overshadowed, mostly because of advances and changes in cooking technology. There is a lot of complex and hybrid cooking units available out there, and this makes it very challenging for the people who choose to cook their food in traditional style finding the necessary cooking equipment. Teppanyaki grill is one of the traditional cooking methods that is very interesting. Yes, you might have heard about the Teppanyaki grill before, but most of the people have not. This cooking method is very common in Japan since this is where it started. However, some people in the western world have not heard of it or seen it. Now, if you’re looking for an afforddable tabletop grill to cook your teppanyaki on, I’d recommend the Costzon Teppanyaki Table Top Grill, which is great value for money at around 55 dollars. I use a stovetop grill plate myself nowadays, but some of my friends have the Costzon and it’s just great fun at a party. What makes Teppanyaki grills so special? Teppanyaki grills are some of the best cooking accessories, especially for people who love their food to be prepared and cooked in a more healthy way. Teppanyaki comes from two words teppan, which means iron pan and yaki, which means grilling. Therefore, Teppanyaki is a word that means iron pan grilling, which enables a person to prepare delicious, Japanese-style grilled food at the comfort of their home. A Teppanyaki grill is just an iron griddle, and it is mostly used to prepare skewers, particularly because they are very thing and long. Just because a Teppanyaki grill is used to prepare skewers doesn’t mean that you cannot cook other meals using the grill. 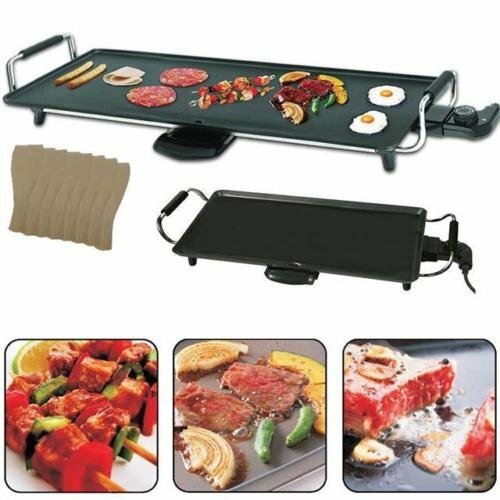 It is possible to cook burgers, eggs, pancakes, steaks, and vegetables using a Teppanyaki grill. In addition, you can also prepare seafood like shrimp and fish using a Teppanyaki grill. As we have seen from above, many grills can cook such meals. However, why is a Teppanyaki grill so special? First and foremost, a Teppanyaki grill assists you to cook food very quickly, and this makes the grill ideal for individuals who are always in a hurry or anyone cooking food for family or at a party. Therefore, this allows you to avoid having ready food sitting on a grill for long before people start eating eat. Teppanyaki grills are suitable for individuals having cookouts or camping trips. Even though you might be forced to serve one person at a time, you don’t have to make each person wait for long. Teppanyaki grills are made of durable and strong material. In additional, it is very easy to clean the grills because of their design and the material used to design them. In addition, you can easily scape off food from a Teppanyaki grill compared to scrapping off food from a BBQ. Lastly, most Teppanyaki grills are smaller that BBQs, which makes it very easy to grease them up. Because it is very easy to clean a Teppanyaki grill, you don’t have to worry about cleaning your Teppanyaki grill after using it like you would worry about cleaning your BBQ. If you fail to clean your BBQ after using it, the food particles can harden, which makes it even harder to clean the grill. 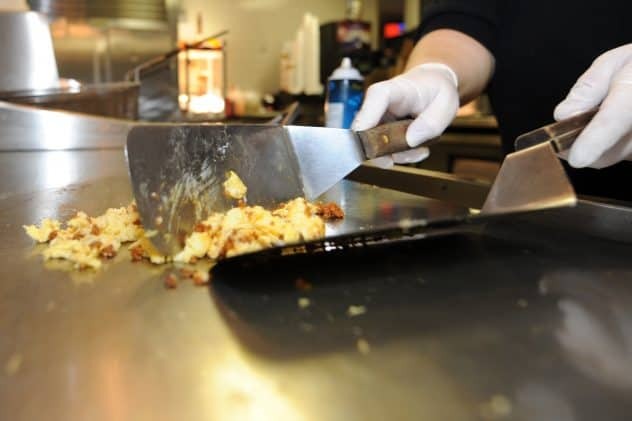 However, the food residue is very easy to clean when it comes to a Teppanyaki grill. 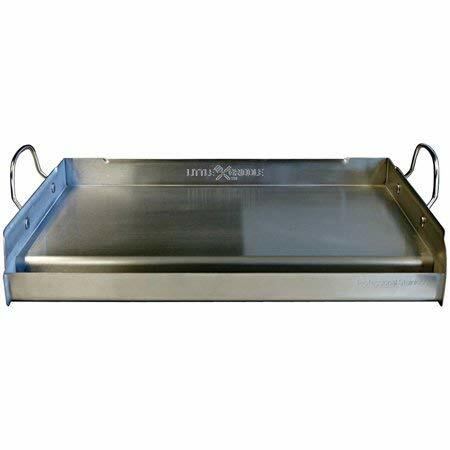 In fact, most of the Teppanyaki grills come with e drip tray or grease tray for catching oil and grease dripping from food. This makes your cooking experience even better. It is very easy to use a Teppanyaki grill in your home kitchen. They are the perfect cooking accessories for cooking seafood like prawns and shrimps, skewers, beef, vegetables and other meals. In addition, Teppanyaki grills are perfect if you want to have an additional meal course. Let us say you are hosting a party and all your vegetables get finished. You can easily cook an extra batch of vegetables long before everyone notices it. This makes a Teppanyaki grill the ideal cooking partner for parties or big social gatherings. This is because you don’t have to worry about cooking excess food since you can always prepare something when people get hungry. Another distinctive feature of a Teppanyaki grill is the unique taste of the food you cook. One thing you should know about using cooking using a Teppanyaki grill is that it allows you to use spices, which still using fresh food products to prepare your food. When you combine this with the Teppanyaki cooking style, you get the opportunity to enhance the flavor of the food you prepare instead of destroying it because of the spices and seasonings. Teppanyaki grills usually use beef as their primary source of meat. In addition, they use dark-leafy green vegetables as well as onions and carrots for their vegetables. The seasonings used Teppanyaki grills include vinegar, wine, soy sauce, garlic, and ginger. It you are a fun of these ingredients, then you will be interested to cook with a Teppanyaki grill. We shall highlight a few Teppanyaki frills in this post and help you choose one depending on your needs. The Costzon 35″ Electric Teppanyaki Table Top Grill is an ideal electric grill for both parties and families. The grill is very spacious with a surface of 35” x 9”, which means you can cook more food on it. It has a nonstick surface, which allows you to cook meals like vegetables, fish, meat and fried dishes without being worried of them getting stuck. With the Costzon 35″ Electric Teppanyaki Table Top Grill, you only need to use very little oil on its nonstick cooking surface and then you will be good to go. That means the grill helps you to cook healthier food. Cleaning the grill is also very easy because of its surface. 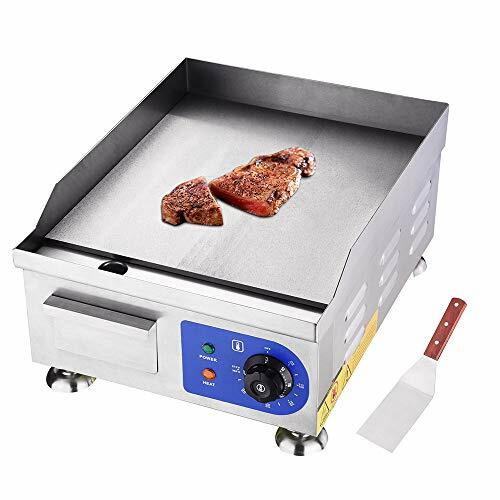 The Costzon 35″ Electric Teppanyaki Table Top Grill is ideal for cooking breakfast and also barbecues without any struggle. One interesting thing about this grill is its portability as it is ideal for camping, caravanning, and travelling as well. This grill comes with an adjustable thermostat, which has 5 temperature settings. This allows you to cook different dishes at their recommended temperatures. 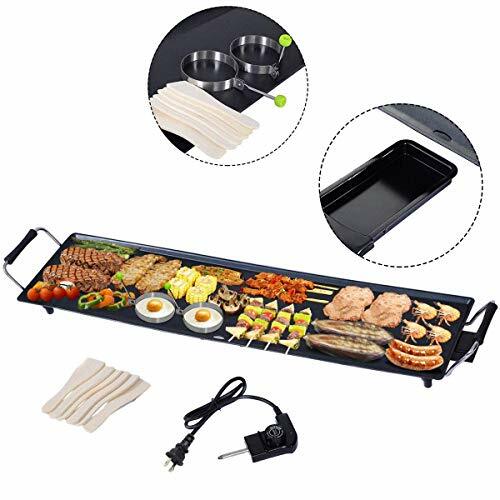 In addition, it has insulated handles on each side that allow you to conveniently move the grill around without burning or heating your hands. Furthermore, its 4 anti-slip feet provides more stability to this grill and they protect your furniture from heat produced by the grill. The Little Griddle GQ230 Professional Series Griddle is the perfect Teppanyaki grill for outdoor cooks who want to have quality and professional results. This is one of the ultimate performers when it comes to outdoor cooking. It is made of a heavy gauge stainless steel, which makes the grill to of the highest standards. One notable thing about the Little Griddle GQ230 Professional Series Griddle is that it transforms your griddle in an outdoor kitchen, where you can cook a wide range of meals. This grill allows you bake and even saute, just as you can do on your normal cooking stove. This grill has 100% stainless steel material, a wide grease well as well as high walls. In addition, it as an underside cross-bracing that promotes even heating. Its removable handles allow you to move the grill easily. In addition, you can remove easily for better cleaning. When you use the GQ230, you will realize how fun it is to cook using a Teppanyaki grill. The grill is easy to clean and it delivers gourmet results for any serious outdoor cook. 4-inch sidewall height. However, you should measure that grill’s interior to make sure that it fits well. also, you should allow a space of 0.5 inches on every side to allow proper airflow. A wide grease well which allows effortless cleanup. 100% stainless steel – restaurant grade. The Camp Chef SG100 Deluxe steel fry griddle is the perfect grill for anyone cooking for a tailgate party or family reunion. At times, you will need to cook lots of food for many people. This is the perfect grill to get the job done, no matter the size of the crowd you are hosting. The Camp Chef SG100 Deluxe steel fry griddle is easy and simple to use, right from cooking to cleaning the grill. It has restaurant-style sides and a spacious grease drain that makes the griddle very convenient. The heat diffuser plates are installed conveniently and they allow even distribution on heat on the entire grill, and they reduce hot spots on the grill. This means, you don’t need to worry about cooking the food unevenly when using this grill. One notable thing about this grill is its Camp Chef’s True Seasoned Finish. This gives the grill a natural cooking surface which is ready to use. Ideal when cooking for large groups. It has cooking area of 24.6 inches and its total dimensions are 38” x 18”. It has a heat seasoning finish with the same color distinction shades. However, you should not worry about it as its normal and continues to change as you use the grill. It covers the entire three burners, which makes it great for eggs and pancakes. It has a grease tray for capturing and removing grease. The grills comes equipped with high wall design which allows easy cooking. The stanbroil griddle is the ideal barbecue-grilling accessory for a person with a gas grill. This griddle enables you to cook different meals at the same time, and it the ideal cookware for outdoor events. The stanbroil griddle can cook different meals like eggs, pancakes, and even barbecues. Therefore, the stanbroil grill is the perfect barbecue gift anyone can ever own. It is very versatile as you can use it for camping, outdoor grilling, take it to the park or even tailgating. The grill is made of 100% stainless steel, restaurant grade, which makes it one of the safest cooking surfaces for outdoor events since it doesn’t contain lead. In addition, its cooking surface makes it very easy to clean the griddle. Another interesting thing about this grill is its high sidewalls, which help in keeping food contained on the griddle as you cook. The stanbroil griddle allows you to cook breakfast, lunch, and dinner from your patio or yard, which allows you to keep your kitchen free from frying pans as well as persistent odors. In addition, you can cook big meals so long as you have this grilling accessory. It is ideal for Japanese or Mexican style parties and even for cooking grilled cheese sandwiches in your backyard. The grill is made from 100% stainless steel material – restaurant-grade. This allows durability and remarkable heat retention. Easy to clean – the stainless steel cooking surface makes it very easy to clean the grill. It can fit on Sprit 700, Spirit 300 series, Genesis Gold B/C, Genesis Silver B/C, Genesis Platinum B/C (2005 model) and Genesis 1000 – 3500 models. This is the perfect electric Teppanyaki countertop grill for cooking meat, vegetables, scrambled eggs, and grilled cheese. It comes equipped with thermostatic control that enables you to adjust its temperature to fit the desired cooking requirement for your different meals. The grill is easy to use and it ideal for both commercial and home use. Commercial flat grill – its thermostatic controls makes it easy to control and regulate the temperature depending on the food you are preparing. It comes with a US standard plug. Temperature range from 50 – 300 degrees Celsius. Overall dimensions – 17 11/16″ x 14 3/16″ x 9 13/16″ (L x W x H). 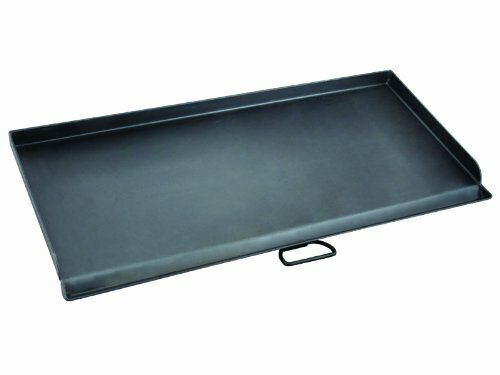 Cooking plate dimensions – 14 15/16″ x 14 3/16″ (L x W). The cooking plate has a thickness of 3/8”. The grill has additional splashguards on its back and sides to protect you and the surrounding walls from hot oil and grease splatters. 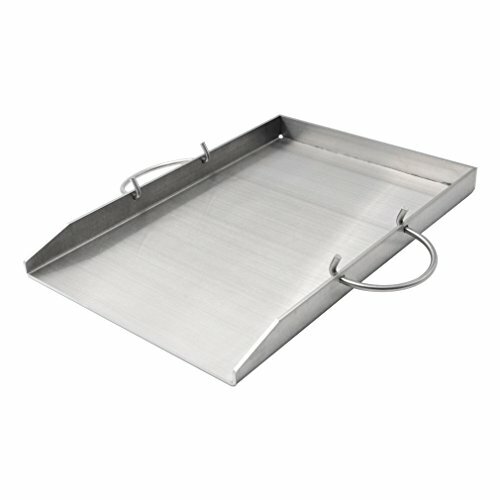 Detachable grease tray for quick and easy cleaning. 4-feet stands give the grill stability. This electric Teppanyaki grill comes with 2 nonslip egg rings and 8 wood spatulas. That means you can cook your favorite meals on this grills for your family and friends. It has a large cooking area, which enough for you entertain your family or guests gathering. Since this grill comes with several spatulas, it means that you can get everyone involved in the cooking, which can make everyone happy. Interesting, isn’t it? The Costway electric Teppanyaki grill has a non-stick surface, which means it requires very little or no oil when cooking. In addition, it comes with a drip tap that helps in draining any excess oil and fat when cooking. This means the grill assists in offering healthy and low fat meals. In addition, the non-stick surface allows you to clean the grill without any challenges after cooking. One interesting thing about this grill is that it has an adjustable thermostat, which features 5-temperature setting. Therefore, you can easily adjust the suitable temperature you need for the food you are cooking. So, you don’t have to worry when cooking things like beef, chicken, vegetables, and fish since the temperature control ensures that you cook ever meal to perfection. The grill’s handles are covered with an insulated cover, which means you can move the grill to your kitchen or garden conveniently and safely. Furthermore, its legs have non-slip pads that protect your cooking platform from the heat produced by the grill. In addition, the non-slip pads ensure that your grill is stable when cooking. This grill comes with a flat-top grilling area of 720sq inches, which makes it the perfect grill for preparing breakfast, lunch, and dinner. You can cook pancakes, eggs, grilled cheese, quesadillas, potatoes, steak Teppanyaki style meals and other different types on meals on this grill. In addition, the grill comes equipped with two side shelves and a bottom shelve, which assists in food preparation and storage. If you buy this grill, then forget about your BBQ and grill since it can do all that without much struggle. The grill is straightforward to assemble and to use, which reduces the time you spend while setting up and cooking. Also, the grill helps you to do away with the issue of charcoal, matches, and kerosene. The Blackstone grill comes with an easy-to-use push start button for ignition, which is battery powered. So, what you need to do is to push the button and then you will be good to go. In addition, this is a perfect grill for outdoor uses, which eliminates the stress of indoor cooking. You can easily move this grill around your backyard or even move to a campsite – thanks to its removable top, foldable wheels and caster wheels. 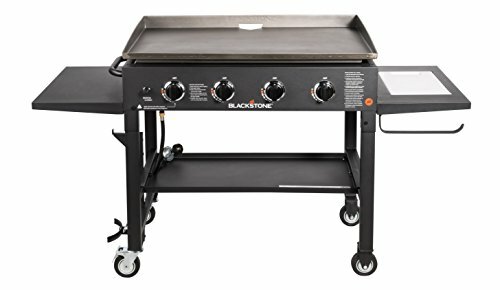 The Blackstone grill comes with a stainless steel frame and burners. In addition, it is equipped with a thick cold-rolled cooktop which makes cleaning the grill effortless. The grill has 4 stainless steel burners that are independently controlled from low heat to high heat. All these grills are ideal for both indoor and outdoor use. Therefore, your Teppanyaki grill choice will depend on the features and your budget. In addition, the size of the grill will also be a big determinant for the grill you choose.